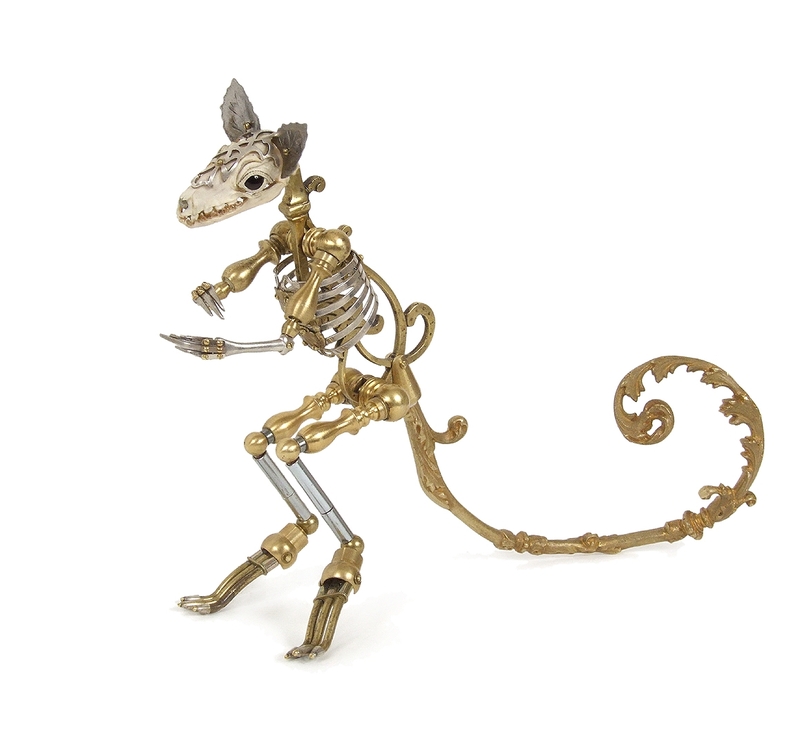 Jessica Joslin is a wonderful mixed media artist who turns animal bones and antique mechanical parts into a menagerie of unusual, yet magical creatures. Her artwork is, at the same time, both whimsical and macabre. 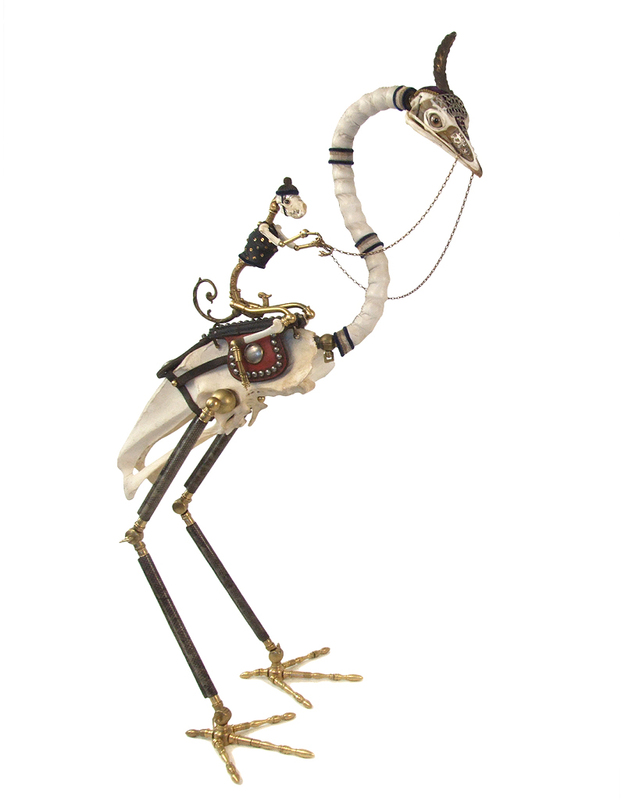 Each of her sculptures starts out as a diverse collection of found objects that is reborn as a new life form. These curious creatures demand your attention with their contrast between life and death; engineered and natural; generalized and detailed; and mechanistic and organic. 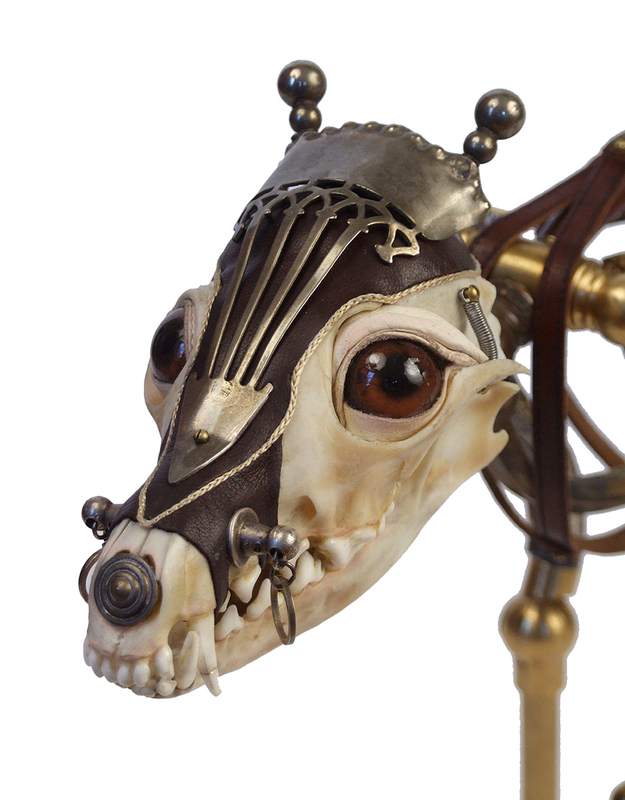 Trained as a visual artist, with a strong background in photography, Joslin is also self-taught in taxidermy, animal anatomy, model making, prototyping, casting and carpentry. 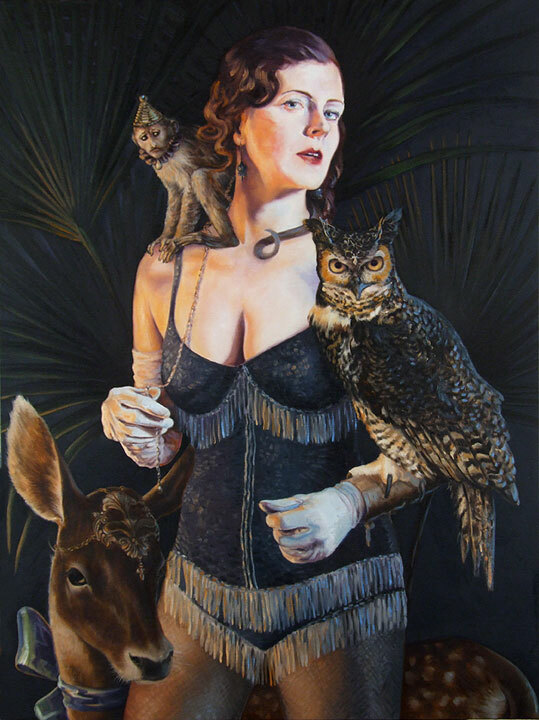 It is this eclectic array of skills that Joslin uses to create her fascinating art. She has pioneered new ground in the art world by following both her passions – art and biology. As a child, Joslin was interested in biology. Growing up in Boston, her father would take her to the Harvard Museum of Natural History where she studied the collections of articulated skeletons in their wooden cabinets. “In part, that really shaped my attitude toward working with bones, because I never saw them as macabre,” Joslin said. “I saw them as a beautiful thing left over from an animal. People tend to associate bones and mortality so they have an instinctual aversion to them. But for me, I’m coming at it from a long- standing interest in naturalism and osteology.” Encouraged by her visits to museums, Joslin also developed a passion for collecting seedpods, bones, seashells, and other objects of natural history. As a young girl, family hikes proved to be treasure hunts for Joslin. Joslin says that she has always loved the taxidermy displays found in natural history museums. 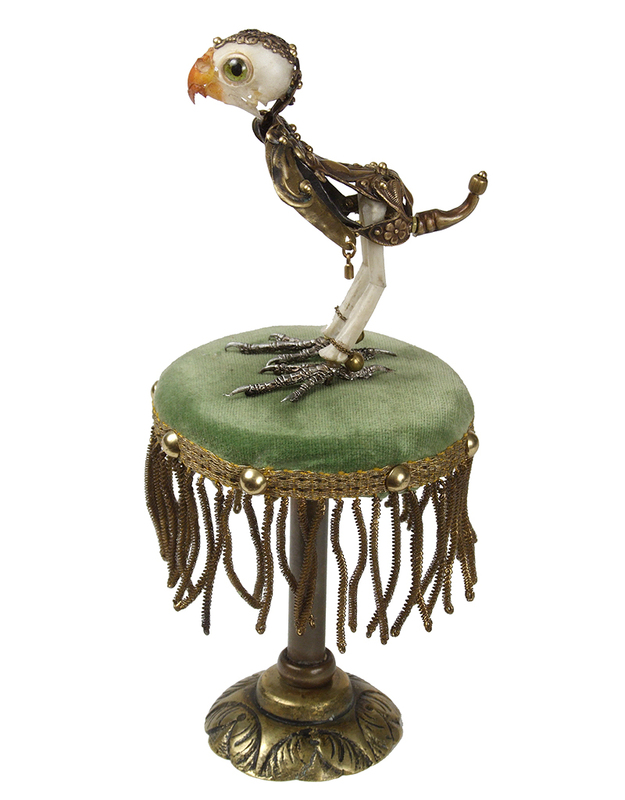 After she began teaching herself taxidermy, Joslin’s artwork began to reflect elements of the craft. 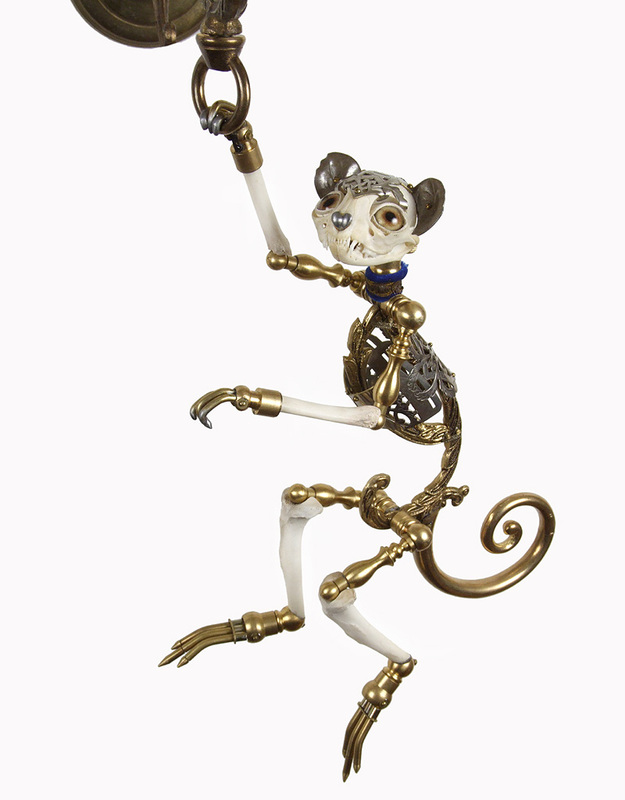 In 1992, Joslin built her first anatomical beast while still attending the Art Institute of Chicago. 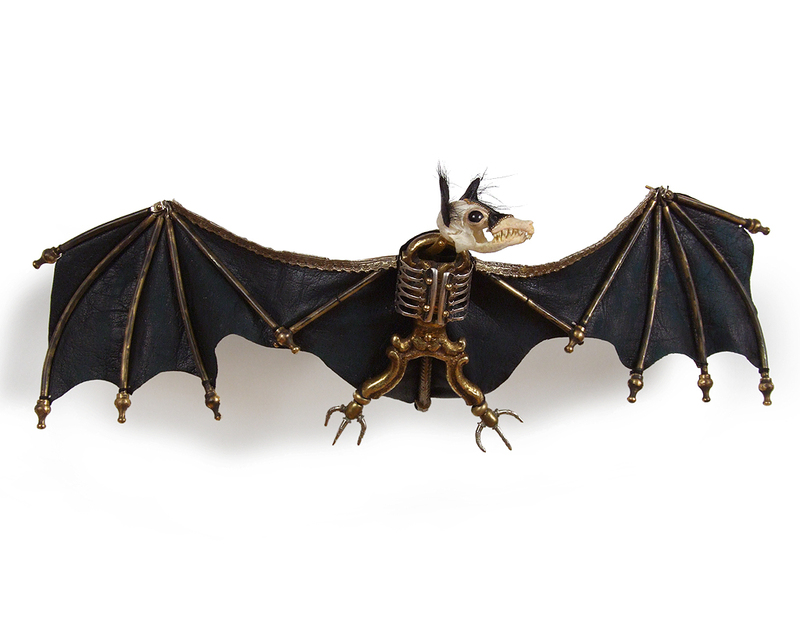 Although related, Joslin’s art, which is inspired by her interest in biology and anatomy, is not taxidermy. 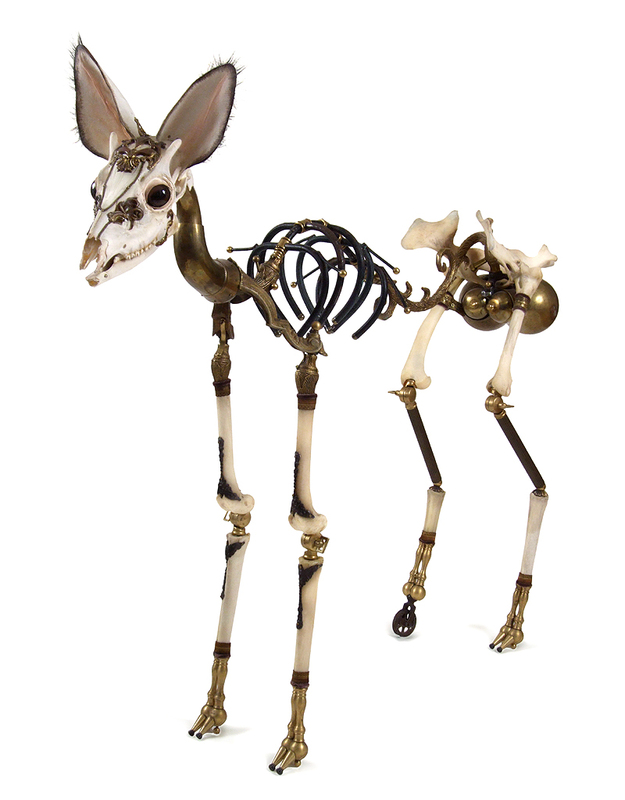 She works with animal forms and uses animal parts, like a taxidermist; but she only uses bones and not the animal’s skin so it’s not taxidermy; it’s more like osteology. 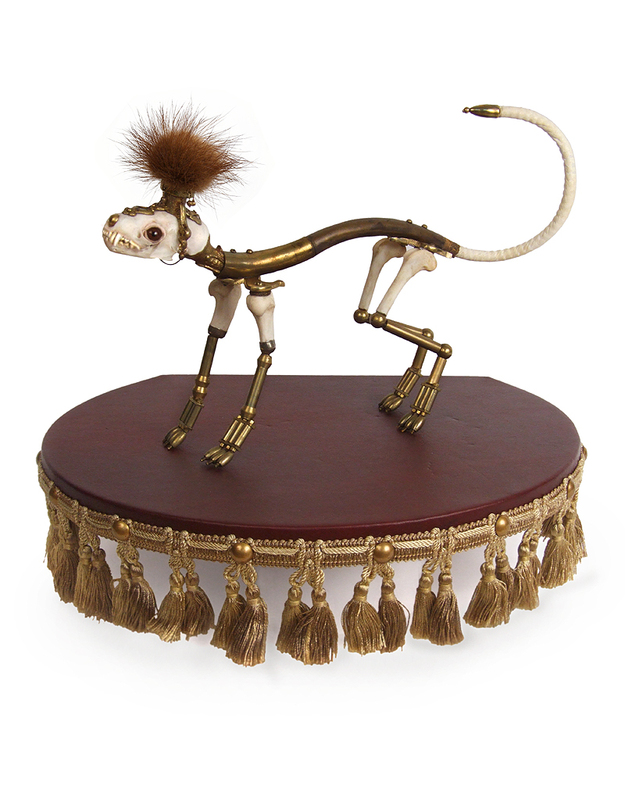 Whereas taxidermy is primarily concerned with the animal’s exterior form; Joslin’s artwork focuses on the internal structure, which in turn reflects the animal’s external form. 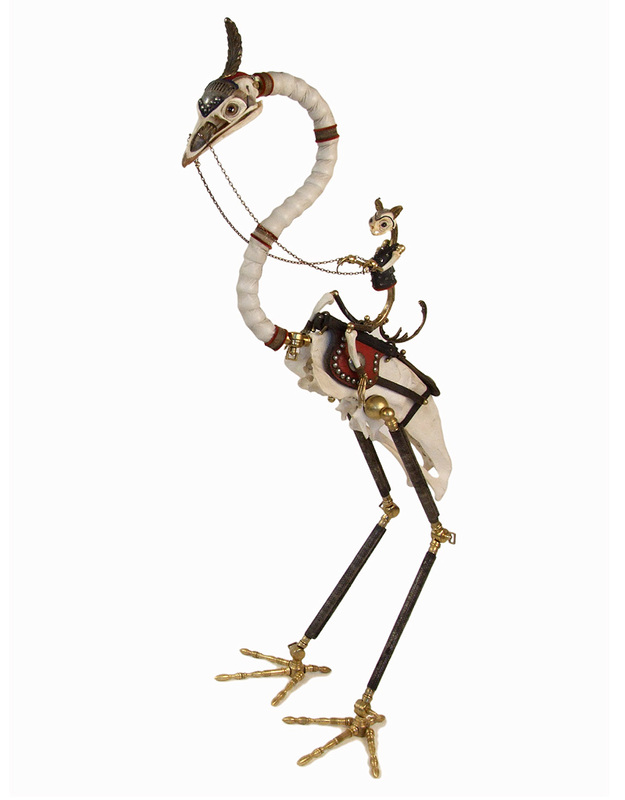 To date, Joslin has created over 200 of her amazing sculptures that range in size from an inch tall to nearly six feet high. 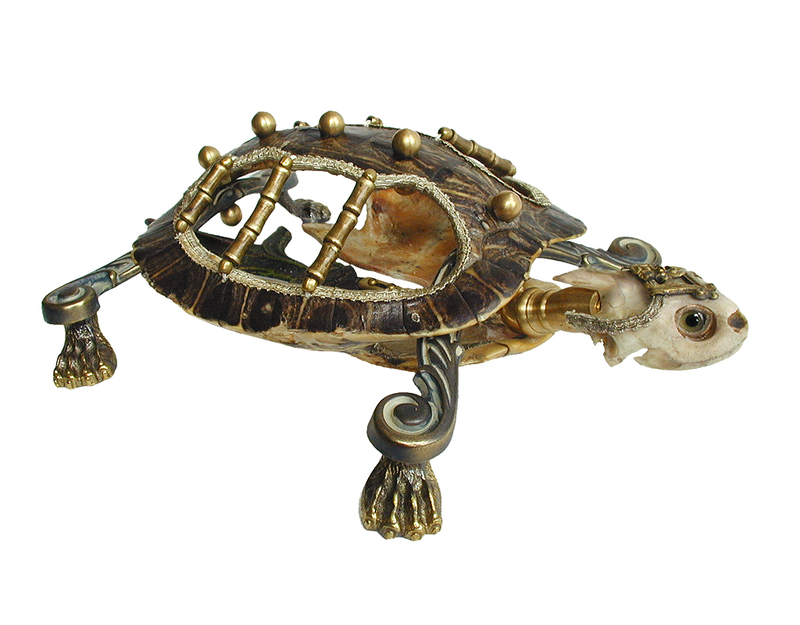 Joslin devotes many hours to perfecting every nuance of a sculpture putting her heart and soul into her art. 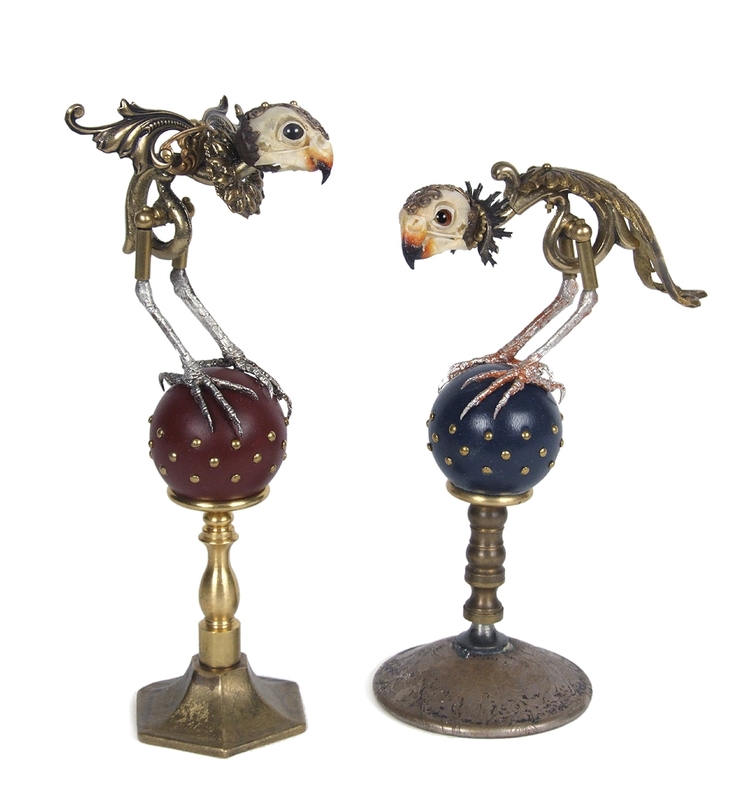 She typically works with found objects, such as antique chandeliers, jewelry, candy dishes, silverware, arcane industrial hardware, animal skulls, or the bones of birds and fish that are reconfigured into the appropriate anatomical forms. 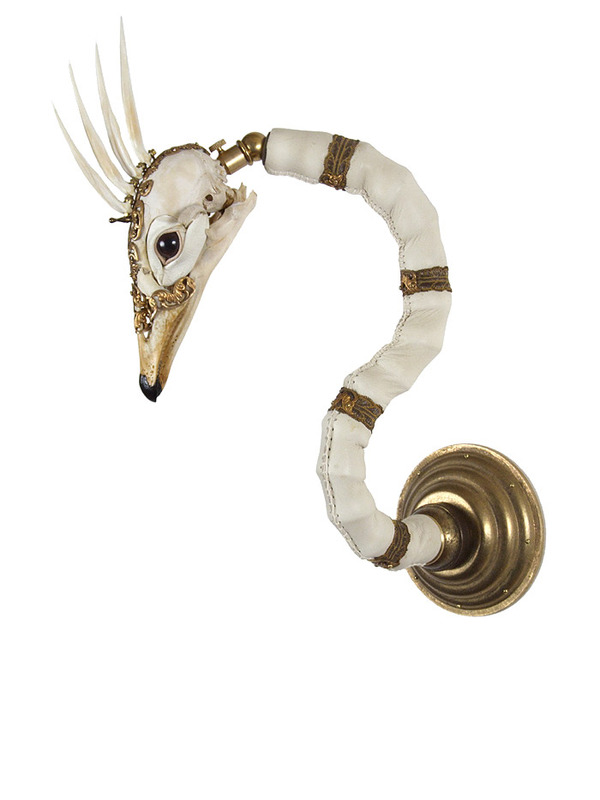 The found objects are carefully selected and then meticulously assembled using mechanical fastenings, such as miniature machine bolts, universal joints, or couplings, into intricate fusions of bone and metal that magically comes to life. Joslin’s artwork provokes strong reactions from its viewers. According to Joslin, “People are either horrified or delighted. There isn’t a whole lot in between!” Those that found her work disturbing were mainly concerned about the animal bones used in the artwork. While those who found the artwork delightful felt a child-like sense of wonder for these magical creatures. 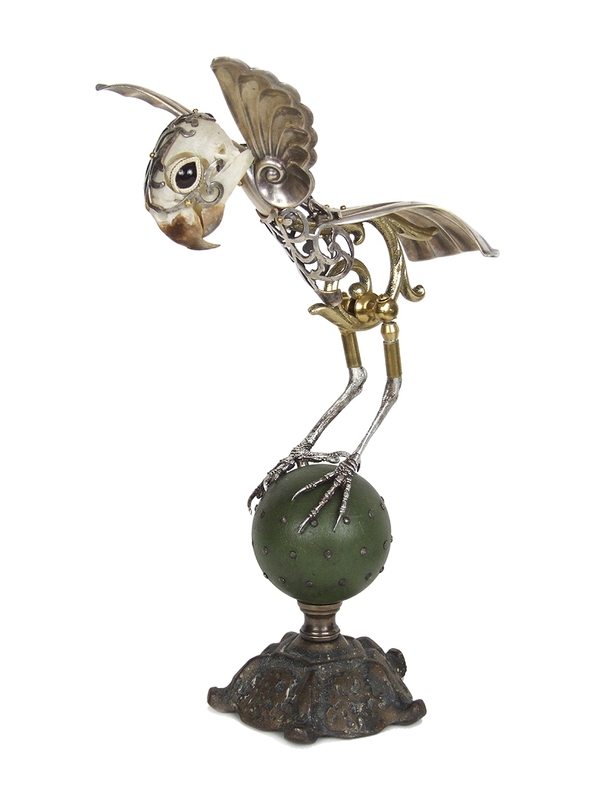 We thank Jessica Joslin, a wonderful artist, innovator and amateur naturist for her beautiful contributions to the sideshow of life. 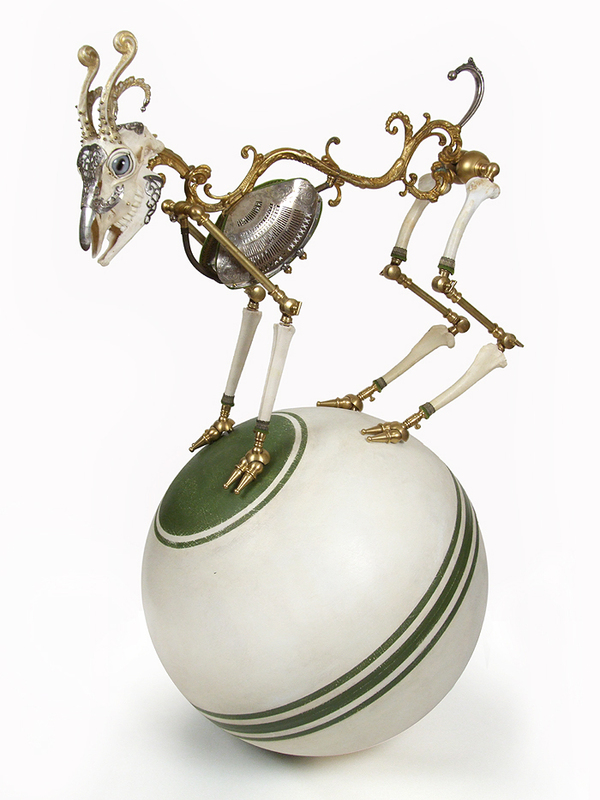 This entry was posted in Uncategorized and tagged animal bones, Art Institute of Chicago, artist, artwork, found objects, Innovative Artist, JARED JOSLIN, Jessica Joslin, Lisa Sette Gallery, magical creatures, mixed media artist, naturist, sculpture, sideshow, sideshow freaks, sideshow of life, skeletons, steampunk, Strange Nature, taxidermy, victorian. Bookmark the permalink.